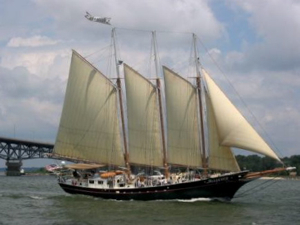 This unique partnership between the Virginia Institute of Marine Science (VIMS) and Yorktown Sailing Charters LLC allows paid guests to learn about Chesapeake Bay and its marine life from VIMS researchers during 2-hour Wednesday afternoon cruises on the York River aboard the 105-foot schooner Alliance. Join us as a crew member of the Polynesian voyaging canoe Hōkūleʻ--docked in Yorktown on its round-the-world sail--shares how anyone can be a navigator of our "island Earth." VIMS staff will help broaden the discussion of ocean sustainability. Join Jessica Small, assistant director of the Aquaculture Breeding and Technology Center at VIMS, to learn about oysters in Chesapeake Bay and how VIMS’ scientists selectively breed these bivalves for fast growth and disease resistance. Graduate student Cindy Marin Martinez of the Virginia Institute of Marine Science will cast a net to see what’s swimming beneath the Alliance. Learn about larval fishes of the York River and how we track their populations.